Tip 1. Explore DIY Projects. Do-it- Yourself projects are not as complex as one may think. With YouTube, Pinterest, and Blog sites hosting substantial tutorials, designing is a cinch. If crafting and woodwork comes naturally or you’re just adventurous, take on a major prolonged project. The savings on labor are well worth it. If skillsets are on the opposite end of the spectrum, then start with something simple and build confidence. Detailed videos and photographs provide step-by-step guidance. The best part is having pace control through the steps. An online video lesson can always be paused and rewound in order to master a stage in the process. Exploring a stint of bravery is sure to be rewarding and reveal untapped abilities for any design enthusiast. Tip 2. Redesign, Refurbish and Repurpose. Work with what you got! Buying a new room may not be necessary. Refresh it by changing the furniture configuration. Then add new wall art, linen, drapes or fresh pillows. Paint is a wonderful tool for performing magic tricks. It’s amazing what a fresh coat can do for furniture, certain decorative accessories and walls. Simply changing hardware can modernize an old piece and give a kitchen a facelift. Salvaging furniture, flooring or accessories may be cost efficient to repair instead of replace. Consider fixing pieces, re-staining wood floors or reupholstering chairs, cushions and sofas. Repurposing items is an ideal way to save cash. For example, a mid-sized mirror can be turned into a chalkboard (with chalkboard paint), used as a tray or centered on a dresser underneath accessories (ex: flowers, candles or etc.). Baskets easily dub as casual magazine holders or unique light fixtures. Tip 3. Shop Savvy and Explore Bargain Locations. Local thrift shops, flea markets, antique stores, garage and estate sales can give you immense value for your buck. Often hidden gems are just waiting to be bargained for at these locals, so don’t miss out. Take a partner and maximize the search with an extra set of eyes. Besides, taking a friend along always increases the level of entertainment. Tip 4. You do not have to Sacrifice Quality. The trick is just a few minutes of online research to become an informed shopper. Look up the corporate website sites of furniture stores before leaving home. The site will provide ample knowledge on how their furniture is built. Tremendous savings up front and long-term are a benefit of knowing what to look and ask for. 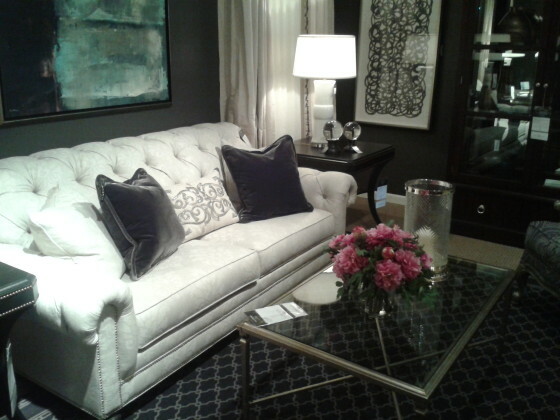 If you fall in love with something on the higher- end at Ethan Allen take a moment and shop around. A similar style with the same or comparable quality may be discovered at a more practical venue like La-Z-Boy Furniture Galley. Knowing which retailers build quality products at a reasonable price is a golden attribute. So pay for higher- end furniture by choice, not from lack of knowledge. Have fun saving your dollars and Happy Designing! Rose Owens is a 34-year-old , Wife, Mother, Product Designer, Interior Decorator and Home Stager. She’s an entrepreneur with a great eye for color, texture, patterns and shapes. Solving design dilemmas is her specialty. She uses just about anything for inspiration when finding or creating dynamic furniture and accessories. Connect with Rose!